Royal Enfield motorcycles are one of the most modified motorcycles in the Indian market. With the latest 650 Twins in the market, there are a range of aftermarket performance exhausts available for them. Here is a new AEW exhaust installed on the all-new Continental GT 650. This is how it sounds. There are a few Interceptor and Continental GT 650 motorcycles out there which already have such performance exhausts installed in them but this is the first time that we are getting to hear the AEW exhaust system. Both the exhaust mufflers have been replaced with the aftermarket products. The exhaust note after installing the exhaust is definitely throaty and deeper than the stock ones. IThe Royal Enfield 650cc parallel-twin engine sounds nothing like the thumping single-cylinder engines of the Royal Enfields but they have a unique sound which feels like a rumble with the stock exhaust. However, with these aftermarket exhaust system installed, the exhaust note has become accentuated and much is much louder than the stock sound. Not much information is available on these exhausts. Generally, aftermarket exhaust systems are lightweight and they help in reducing the overall weight, which in turn increases the performance of the bike. Also, a few aftermarket exhausts ensure better performance by ensuring quick movement of the exhaust gases. The price of the aftermarket exhaust is not known right now but the pair of exhausts must have cost below Rs. 10,000. While most of the aftermarket exhausts are much louder than the stock ones, they are not road legal. Most performance exhausts are for only track-use or can be used in the private property. 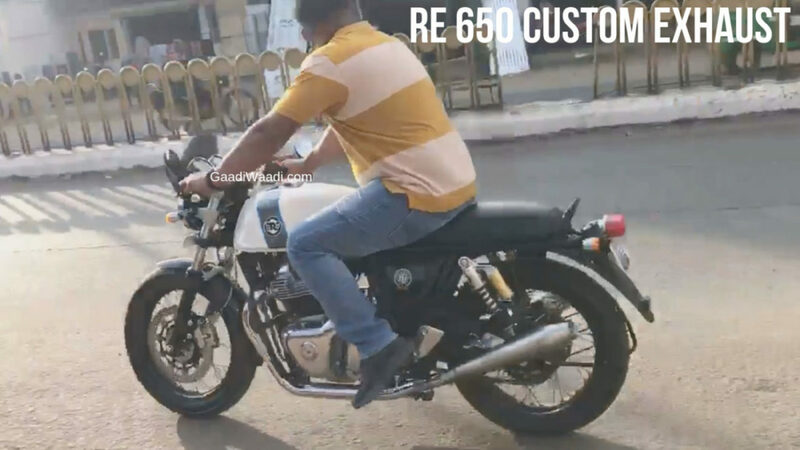 In the past, cops from various states have targetted Royal Enfield bikes for installing aftermarket exhausts and have impounded the exhausts. A few police forces even destroyed the aftermarket exhaust but these being new bikes, it would take some time the cop realises that they are much louder than the stock exhaust system. The Royal Enfield Twins are powered by all-new parallel-twin, air-cooled engine that produces a maximum power of 47 Bhp and peak torque of 52 Nm.